The latest DLC for Dragon Age was uploaded to Xbox Live yesterday, but hold off on the fanfare for now. If you, like most people, weren't aware, Dragon Age: Origins DLC pack Return to Ostagar quietly made its way onto Xbox Live yesterday, but it doesn't look like this is a good thing. Those who downloaded the expansion seem to have introduced an undetected issue that re-locks previously unlocked specializations. 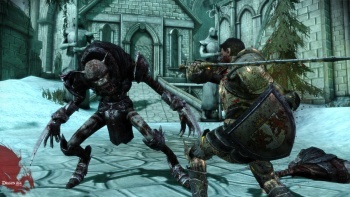 Specializations in Dragon Age are unique skill paths that can only be unlocked after reaching levels 7 and 14, and also require convincing certain characters to teach them or the proper manual to be found. Having these locked up again would be quite an annoyance. Yesterday, BioWare Community Coordinator Chris Priestly happily announced that Return to Ostagar was "unexpectedly" available for download on the Xbox 360 and that the PC version would be coming later in the day. As of today, he's since written that an Xbox Live "title update" that was "made available in preparation for the release of Return to Ostagar" is causing the specialization issue. BioWare is removing Return to Ostagar and doesn't recommend downloading the title update until all issues are resolved, while those who have already downloaded it have a fix incoming. As far as the PC version of Return to Ostagar goes, it doesn't look like it ever made it out of BioWare, or I couldn't access it as of this writing anyway. The PS3 version was promised "later," which could mean within a day, a week, a month, a year, 200 years, or 10 seconds. When Return to Ostagar eventually ends up with a working release, it'll take players back to Ostagar. Yup, that's all I'm saying; I don't want to spoil anything.